Just before the top of Pass on 154, the old road can be followed to the Left, past Cold Spring Tavern, under the bridge, etc. Just after you leave 154 to the Left, in a short distance, there was a LARGE Historical Marker on top of a large Boulder. If memory is correct, the marker information explained that general Fremont's troops camped on that spot before going down the mountain to take Santa Barbara. 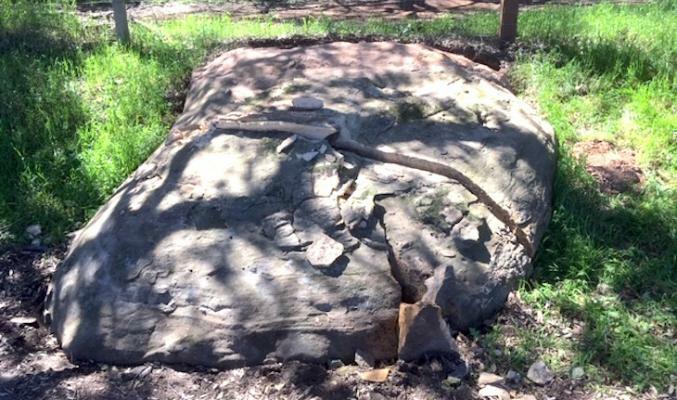 The boulder is now cracked and damaged beyond anything caused by nature, at least in my opinion. The Marker is gone! Why? When did this happen? Is this another attempt to "correct" an event is history that some folks find wrong? Somehow this just seems wrong. Can someone here explain? Here are 2 photos for the historic marker arrival that came out a day or so ago. I noticed there are several comments on the Freemont Marker which is missing or damaged. I took this photo of it in December 2018 and you're welcome to post it to your website. Nice link and motivation to learn more about the history of how CA and TX came to be part of the US. If my introductory skim is correct, the US annexed CA and TX from Mexico? Perhaps Putin was just following our lead in Ukraine? Had no idea Kit Carson was in play at the time. We stopped by yesterday and checked out the toppled rock and the gapping hole where it had been “rooted.” Gravity is not just a good idea, it's the law. Photo being sent in to Ed. NATURE BOY, Fremont helped take Santa Barbara from Mexico, for the United States. So how about some actual historical facts? Was General Fremont a bad guy? When did he “take” Santa Barbara and who did he take it from? Did he warrant a plaque in his honor? If not, I’m not saying it was right to remove it, just looking for some backstory. Fremont was a fairly competent explorer, mediocre map maker, and opportunistic politician. His military skills were lacking; as a general officer he spent the Civil War being relieved of commands. He was the Repubublican Party's first Presidential Candidate. Thoroughly overrated. If the marker was made of copper someone probably hauled it off to the recycling center. Most all of the Camino Real bells were replaced with fiberglass ones years ago. Over half had already been stolen from remote areas then, some 20 to 30 years ago. Almost certainly, it was stolen for scrap. Bronze plaques are a prime target for thieves to steal and sell for scrap metal. Camino Real bells are also targets. It's a societal lowest common denominator thing. It's hard to tell who is actually serious here, but I am and I think it's a shame when our town loses the things that make it interesting. I do know it didn't simply fall down, It's not "under the Boulder", and the rock did not crack and have large chunks break off on it's own, or move in the last rain event. So 26tpi aare you a witness? A suspect? A person of interest? How do you know these things? I am curious... How do you know the marker isn’t under the boulder? Or that the boulder didn’t fall on its own? Comparing this picture to the a Google street view one, I’d guess the rock fell flat on its face. That US annexation thing hasn't been working out, forget Fremont and the marker. Google maps street view isn’t a current/live image that could’ve been taken months ago. Or years ago....it says image from 2012. It came down a couple weeks ago with the rain. The marker is still there, it's just under the rock. Someone thought it was going to be used as the subject of a March Edness photo, so they moved it so no one could find it. Best check the other Fremont marker on Foxen Cyn Rd for support on any conspiracy theory.